Say this at least for the Clackamas volleyball team — the Cavaliers went down swinging. Clackamas, playing at fourth-ranked West Linn in the second round of the Class 6A state playoffs on Saturday, stepped up to win the first set against the Lions and pushed West Linn the rest of the night before ultimately falling 23-25, 25-20, 25-22, 25-15. "The first set was better than the last three," said setter Jerionna Caston, one of five seniors on the Cavaliers' roster. "We had a lot of energy and we came out strong. We just didn't push through the last three." "Tonight, we struggled a little bit mentally, but we really have had a lot of good chemistry on the team, on and off the court especially, so that's just really been good," added senior middle blocker Grace Fonville. With the loss, the 13th-ranked Cavaliers ended their season at 18-5 after going 11-3 and placing third in the Mt. Hood Conference. The Lions, meanwhile, won for the sixth straight time and improved to 20-5 overall after winning the Three Rivers League at 14-0. Next up, the Lions will return to the Class 6A state tournament where they finished third a year ago; West Linn will face No. 12 Sheldon — the Southwest Conference champion — in the quarterfinals at 1:15 p.m. Friday at Liberty High School. 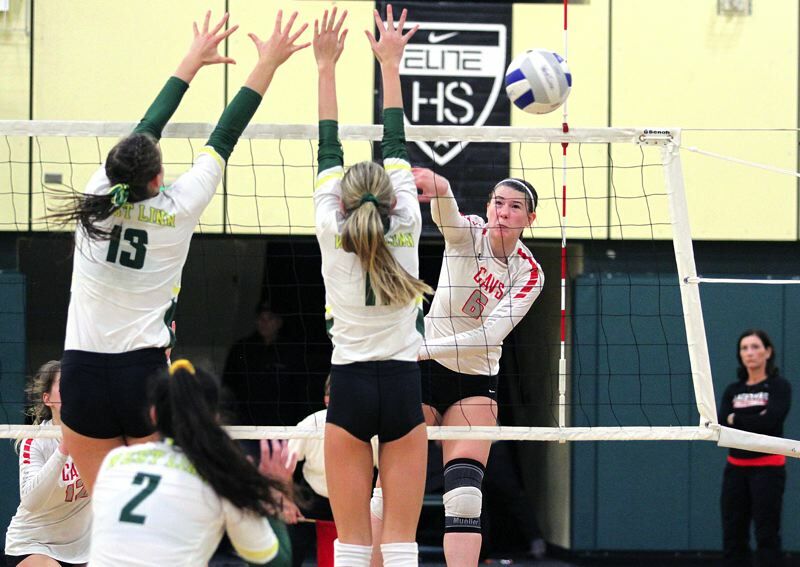 "(Getting back to state) was a huge goal of ours and we didn't want to end this season on a loss on our home court," said West Linn senior libero Ellie Snook, the two-time TRL Player of the Year. "We are going to go out fighting." "We had to come in here and play our game and that's what we did," added West Linn sophomore middle blocker Makayla Long. "I'm so happy we made it back (to state). We worked our (tails) off to get there." Getting there wasn't easy, however, thanks to talented Clackamas. The Cavaliers — getting big contributions from Caston, Fonville, senior middle blocker Kalani Hayes, sophomore libero/defensive specialist Christin Kwon, and junior outside hitters Jaiden Armitage, Jayla Parnell and Jaiden Eubanks — fought off a tough West Linn challenge to take the first set 25-23 and put the Lions back on their heels. "The first set was exactly how we wanted to play," Fonville said. "We came out there strong, mentally tough, and we bounced back from any errors we made and that's exactly how we wanted to start." Clackamas kept the pressure on in the second set, too, leading 18-17 before the Lions closed the set on an 8-2 run highlighted by five Long kills, the last of those from the right side set by sophomore Kate Griffin to make it 25-20 and tie the match at 1-1. The Lions started faster in the third set and led by as many as six points, the last time at 17-11 when Long notched a kill down the line from the right side. But the Cavaliers fought back from there, closing within 24-22 on two Armitage kills and an ace, two blocks by Hayes and a tip from junior Isabelle Combs before West Linn edged away to win 25-22. In the night's fourth set, the Cavaliers strung together three straight points — a kill by Hayes and back-to-back tips by Caston — to close within 16-12. But the Lions held the upper hand down the stretch, ending the match on a 9-3 run that included a kill and an ace from sophomore outside hitter Audra Wilmes, a kill and a stuff block from senior Erika Isaacson, an ace by senior Hannah Hashbarger and a block from Long. Despite the loss, the Cavaliers expressed gratitude for the togetherness the team built over the course of the season. "This is the best group of girls I've ever played with because we all get along. I've never had that happen. We all got along," Caston said. "That's the best part about this team for me, because if we didn't get along, there'd be no team." Also finishing their senior seasons for Clackamas were senior defensive specialist Katrina Varney and senior outside hitter Abby Norris.